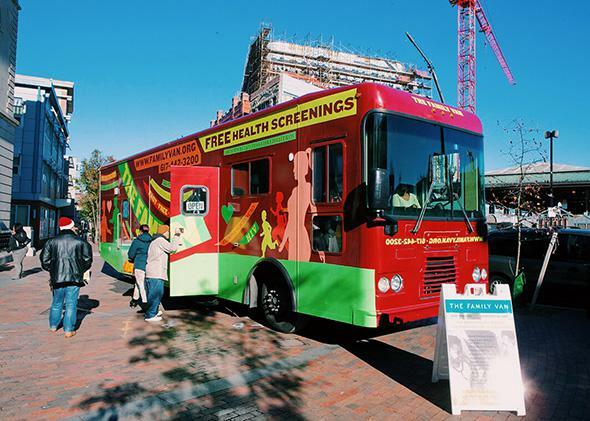 Mobile health clinics: Outcomes, community relationships, privacy concerns, success rates. Mobile clinics are a great way to deliver health care. The Family Van in Dudley Square, Boston. In the early 1960s, my grandfather traveled from village to village in South India to treat his patients at makeshift medical camps. He would set off in a jeep in the morning with a nurse, a drug compounder, and a helper. They’d park their jeep at a set spot, often under a tree at the village’s boundaries. Though they were called camps, that word is a little elaborate. Often, the clinic simply unfolded as a table and a chair under the tree. Patients waiting for the arrival of the jeep would queue up, and the sessions would begin—conversations, diagnoses, advice, prescriptions, and referrals for follow-ups at bigger clinics. Within an hour my grandfather’s team would pack up and head off to the next location, covering about four or five villages by noon. The idea was simple. If you did not have access to a doctor, or could not get to one, the doctor would come to you. I was reminded of this when I recently visited the San Mateo County mobile health clinic parked behind a neighborhood library in Redwood City, California. The mobile clinic sees about 10 to 25 patients a day at various locations near community centers, adding up to 3,400 patient visits last year. It’s a walk-in clinic, no appointment necessary. Residents can get immunizations, emergency contraception, blood pressure and blood sugar screenings, tuberculosis tests, and general advice on health care. It’s a little difficult to define health care. But broadly, it has to do with helping people live healthier and longer lives, affordably and sustainably. By that metric, things don’t look great for the United States. Last year the Organisation for Economic Co-operation and Development took a stab at assessing health care efficiency by plotting a country’s life expectancy against that country’s health spending per person. Most of the results across its 34 member countries seemed predictable. They fell on a trend line that broadly showed that the more a country spends on its people’s health, the longer its people live. But it also showed one distinct outlier. On average, Americans have the same life expectancy as Chileans (78.7 and 78.3 years, respectively), but Americans spend five times more. Our $8,500 per capita spending is more than twice the amount for France and the United Kingdom, both places where people live longer than Americans. Chronic diseases—what the Centers for Disease Control and Prevention calls “the most common, costly, and preventable of all health problems”—accounted for seven of the top 10 causes of death in 2010. Something isn’t right when Americans pay more for less, and die of preventable conditions. In 2012, Massachusetts’ Executive Office of Health and Human Services charted out a five-year plan to reduce the number of people with chronic diseases. The program called for better links between the community and the clinic—something it said could be done by employing more community health workers and deploying more mobile health clinics. Mobilizing health care is a simple, obvious, and underutilized idea. This is about taking screenings, primary care, advice, and in some cases even hospital-grade triage out of the building and as close as possible to people’s homes. By doing this, we also get as close as possible to the early stages of health issues. It seems obvious, and yet it’s rarely implemented. 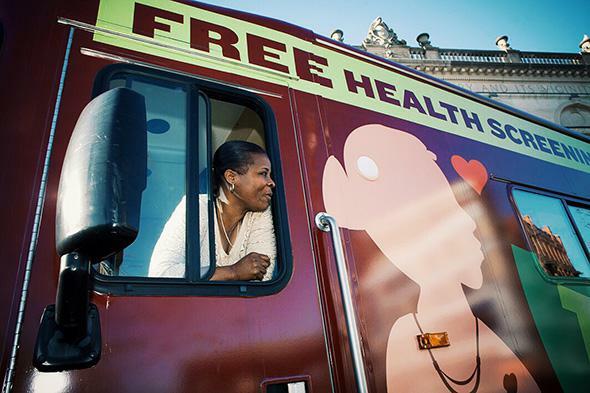 An estimated 1,500 to 2,000 of America’s clinics are on wheels. They get about 5 million to 6 million patient visits a year. That sounds like a large number, but it’s less than 1 percent of all patient visits, going by very rough and conservative estimates from 2010 census data. A majority of the mobile clinics reach communities that don’t have easy access to decent health care—uninsured, underinsured, or people far from health care centers. Patients get screened for hypertension, depression, and vision problems. They give blood samples to get their cholesterol and blood sugar numbers. They get advice on diet and on contraception. They get treated for minor injuries. It’s primary and preventive care on wheels. Mobile clinics also often offer flu and vaccine shots for adults and children. It’s a good thing to highlight, especially with the recent rise in measles and whooping cough cases. The source of the recent Disneyland outbreak that led to 147 measles cases might have been outside the country. But under-vaccination increases the risk of the disease spreading. Similarly, by the end of 2014, the CDC got wind of 28,660 cases of pertussis, or whooping cough. Pertussis cases in 2012 were higher than any previous year, going back to 1955. There could be many reasons for the rise—people’s awareness is on the rise, immunity is on the decline, doctors have better ways to diagnose, the bacteria is more prevalent. However, those without the right vaccine are at higher risk and also spread the risk. A mobile clinic is care that works. Take the Family Van, a mobile clinic operating in the Boston region for the past 23 years. In a 2013 study of 5,900 patients who made more than 10,500 visits to the van between 2010 and 2012, researchers focused on people who had high blood pressure at their initial visit. During follow-up visits, the patients showed significant reductions in their blood pressure, which was associated with about 45 percent reduction in the risk of a stroke. In other words, for these patients, a trip to their neighborhood mobile clinic triggered potentially lifesaving behavioral changes. 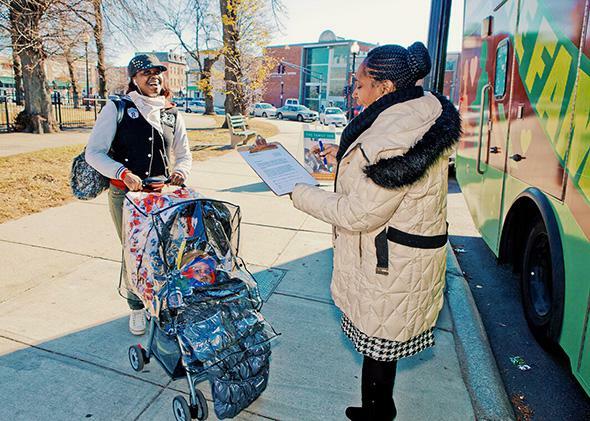 Rainelle Walker-White, direct service manager for the Family Van, doing outreach in Central Square, East Boston. But people aren’t coerced into a checkup. They do it voluntarily. And while proximity reduces the barrier, trust is still a huge deal in health care. Why should anyone trust a mobile clinic, and trust it enough to visit again? How can you talk in confidence with a clinician when the clinic is so small? Who are these clinicians? While the relatively small space in a mobile clinic does seem to pose challenges, health workers have turned it into an advantage. The Family Van runs what it calls the Knowledgeable Neighbor model, employing and training community health workers from the communities where the van is parked. The staff take care of little things like ensuring that computers are placed in such a way that health workers never have to turn their back to a patient. Nobody wears lab coats. Helping patients identify with health workers bridged the gap. “They speak the same language, literally and figuratively,” said Bennet. A 2010 study of an Appalachian mobile clinic in southeastern Ohio showed that the health workers navigated privacy concerns in the small space by “merg[ing] personal and professional discourses.” They routinely used their own experiences to foster an environment where patients felt freer to talk. They would turn up the radio during a consultation to prevent others from overhearing the patient, and methodically keep patient documents and schedules turned facedown. Ghislaine Firmin, a Family Van health educator and driver, in Dudley Square, Boston. In such personalized settings, the power dynamic is very different from how it is in a traditional hospital. Patients often share their concerns about a range of issues in their lives that go well beyond a blood pressure screening. These may include problems with their children or spouse, depression, concerns about smoking, finding a job, and paying rent. “People come on the van with their lives,” says Nancy Oriol, a professor of anesthesia at Harvard Medical School and co-founder of the Family Van. But scaling trust isn’t easy. Even a successful clinic like the Family Van has failed at times when it has gone out into a new community, despite having the recipe and experience. When it has failed, Bennet says, it has usually been because staffers “didn’t feel like we had the community buy-in.” Each case requires a careful buildup of trust, community participation, and awareness. Without a tight community to work for or with—for instance, a low-density suburban population—the mobile clinic could easily become another failed experiment. There are, of course, others who have eyed the market for health care services. More than 1,700 retail clinics have popped up across the country, with projections to go up to 2,800 to 3,000. They are mostly run by five big players—CVS, Walgreens, Kroger, Walmart, and Target—with CVS alone accounting for more than 800 MinuteClinics. Everywhere you look, health care today is largely a fee-per-service industry. Whether it’s a screening, consultation, or surgery, the costs are siloed under each service, without explicit connections. The system rarely factors in the effects of preventive screenings in reducing future hospitalizations, for instance. Health is a long-term endeavor, but it’s being measured against short-term profit goals and narrow performance indicators. And by that yardstick, mobile clinics don’t have much going for them. How do you explain the costs of setting up a mobile clinic that may offer free diabetes screenings that eventually lead to months of regulated diet and exercise? Mobile clinics recently found a way of quantifying their benefits. A team of researchers, including Vavasis, Bennet and Oriol, in 2009 developed a way to calculate the return on investment for a mobile clinic. Based on patient visits to a clinic, they considered potential savings from avoided trips to hospital emergency departments and from screenings that identify preventable diseases. The country’s emergency departments get more than 9 million visits from patients that are classified as non-urgent. For the uninsured, the emergency department becomes the only reliable primary care option. People turn up even for routine physicals, as one doctor told me. If a needless and expensive trip to the emergency department can be avoided, that’s money saved. The researchers estimated a dollar value of preventive care services based on data from the National Commission on Prevention Priorities. The researchers came up with a return on investment figure for the Family Van: Every dollar invested brought a return of $36. In a later survey across more than 670 clinics, the estimated returns were about $17 for every dollar spent on the clinics. A $17 return on investment is a whopping return, but these are hypothetical dollars, saved by the health care system in general. The money doesn’t come back to the mobile clinic. To make these savings real and visible, an alternate approach would be one in which health care completely reorients around outcome, not service. Health care is a constellation of providers—nurses, doctors, hospitals, insurance agents, administrative staff—who work to treat a patient. Measuring the health of health care is about ensuring that patients are treated well, with trust, and with less money. That is, trying to get the United States back on the trend line that links health care spending and life expectancy. Since 2012, under the Affordable Care Act, more than 500 accountable care organizations, or ACOs—networks of doctors and hospitals—have been delivering coordinated care. They are eligible for bonuses if they run efficiently and can keep overall costs down. Many of the performance measures revolve around preventive and chronic disease care. Most of them are Medicare ACOs, which are measured under 33 quality measures including how well a doctor communicates, influenza and pneumococcal vaccinations, depression and obesity screenings, and shared decision-making between the patient and provider. And they seem to be effective, going by an estimated $417 million program savings, according to a report by Sean Cavanaugh, the deputy administrator and director of the Center for Medicare. A health care group might spend money to invest in better preventive care. If it can then reduce patient visits to the hospital, it can earn more. But if it struggles with that, it might also have to absorb the extra costs. A recent paper co-authored by the architects of the return-on-investment calculator suggested one way to close the loop would be to integrate mobile clinics into a larger health care system. The authors pointed out the importance of knowing and working directly with communities. “Mobile clinics are uniquely qualified to provide high-quality care to underserved populations, and they can do so with considerable cost savings,” they wrote. If mobile clinics are integrated well, they could serve as vital cogs in the health system. They’re about delivering care closer to and centered around patients, porting them to a bigger health center when needed, and addressing a medical condition before it becomes a 911 call. Some of the obstacles that mobile clinics overcome are things that everyone has faced at some point with the current health care system—the difficulty in carving out time away from work, the mental calculations people sometimes make when trying to figure out whether a trip to the doctor is necessary, and the intimidation associated with such a visit. Mobilizing primary and preventive care is a simple and obvious idea. It is not a radical concept. It’s already done across the country, just not done enough. These methods have been shown to be efficient, both qualitatively and in dollars saved. But mobilizing them takes time. The big question is whether the health care system will reward long-term efficiency.